The food extravaganza of Dubai has so much to amaze you, no matter what time you are planning to eat. From breakfast to dinner, the city offers you countless options to gratify your dribbling taste buds. Dubai has a wide array of restaurants and hotels where you can find delicious cuisines ranging from authentic Middle Eastern and Arabic cuisines to Asian, European and international food delicacies. There are a number of restaurants that obliges exactly to your taste and preferences, and deliver you the best and authentic flavors at the best price. 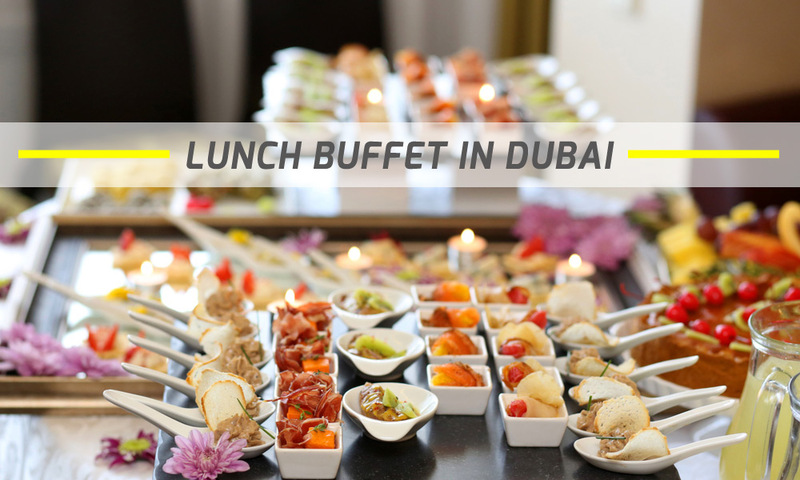 However, the visitors, residents, locals and tourists specifically prefer lunch buffet feasting in Dubai, as they get a bigger chance to try out a variety food at a better price value. Dubai has a great range of buffet restaurants that offers Indian, Pakistani, Italian, Chinese, Japanese, French and Arabic cuisines. With such an inclusive range one much be coddled with the choices here. There is nothing like cherishing time with your friends and family at the breakfast, lunch or dinner buffet where you can find all those luscious and lip-smacking flavors from all over the world at fair worth. Usually all the restaurants offer buffet options at dinner in Dubai; however, there are some amazing restaurant in Dubai, which offers tremendous all-day dining features of buffet at lunch, breakfast and brunch. Here revealed are the best five lunch buffet in Dubai, that offer you the best variety of flavors from every corner of the world. Anise is one the finest place to enjoy a luscious lunch buffet in Dubai with a great ambiance accompanied by world-class startling cocktails and delectable deserts. Anise offers you to enjoy an inclusive range of Middle Eastern, Arabian, European, Asian and Continental recipes. Sushi, Indian fish curry, king prawns and chocolate fudge cake are the premium delights at Anise. This lunch buffet restaurant is situated at the lobby level of Intercontinental Dubai Festival City. Being super-famous for reasonably priced, high quality buffet, Anise is usually occupied; thus a prior reservation is recommended. Kitchen 6 @ JW Marriott Marquis Hotel is another brilliant choice for all-day lacy feasting in Dubai. It features marvelous Asian, European, Middle Eastern, international cuisines accompanied with rich cocktails and soft drinks. Kitchen 6 rejoices the superlative flavors from every corner of the world and cost you around AED 140 per person. Kitchen 6 serves lunch buffet in Dubai, between 3 pm to 6 pm. Kitchen 6 @ JW Marriott Marquis Dubai is located at the 1st floor of JW Marriott Marquis Dubai, Business Bay at Sheikh Zayed Road- Dubai. They also offer hearty breakfast buffet in Dubai as well. Latitude is another amazing place to enjoy a big lunch buffet in Dubai. Encumbered with a wide range of local and international cuisines, this place is fantastic for having an ostentatious lunch. They offer a lunch buffet with an elaborated assortment of delicacies. At Latitude you can find an international style theme buffet with an inclusive variety of main courses, deserts and beverages. Latitude is the place one ought to be if one wants to indulge oneself to the fullest with culinary extravaganza. This is also an idyllic place to enjoy the beautiful sight of shoreline and Burj Al-Arab. Latitude is located in Jumeirah Beach Hotel on Jumeirah Beach Road – Dubai. Al Dawaar could be a great option for having a splendid lunch buffet in Dubai along with having a great opportunity to enjoy the beautiful panorama too. It is the only revolving restaurant in Dubai and it offers fascinating 3600 views of the shoreline and city lights. The Al Dawaar restaurant offers a great variety of Arabian, European, International and Middle Eastern cuisines. Their desert and salad are to die for. They also offer a seafood buffet in Dubai & their seafood section is specifically famous for its delectable variety of sushi, mussels, sashimi, shrimps, prawns and oysters. Al-Dawaar is located on the 25th floor of the Hyatt Regency Dubai – Naif. Prior reservation is recommended. Sloane’s offers the finest lunch buffet at a great price value in Dubai. The place is encumbered with delicious main courses, mouth watering deserts and lip-smacking cocktails. Sloane’s offers a great variety of continental and local cuisines. The environment of the place is very delicate and decorated. The place offers a great assortment of breakfast, brunch, and dinner too. Sloane’s is located in Grosvenor House on Al Sufouh Road – Dubai. These are some of the restaurants that offer a quality lunch buffet in Dubai. If you want to recommend a restaurant that offers a buffet lunch in Dubai, please do so by adding comments below.